← Wordless Wednesday – Dance With Me in the Snow? 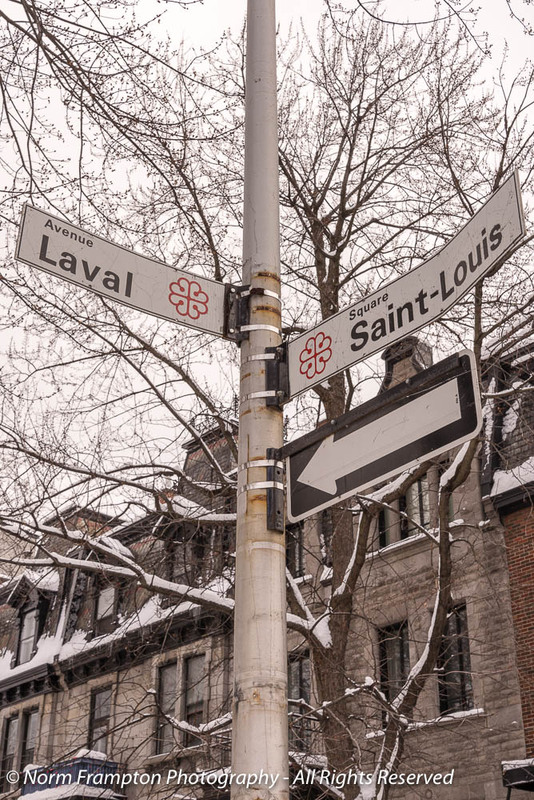 Often incorrectly called Carré St-Louis, the square and it’s surrounding Victorian architecture are considered iconic symbols of 19th century life of the well-to-do in Montréal. 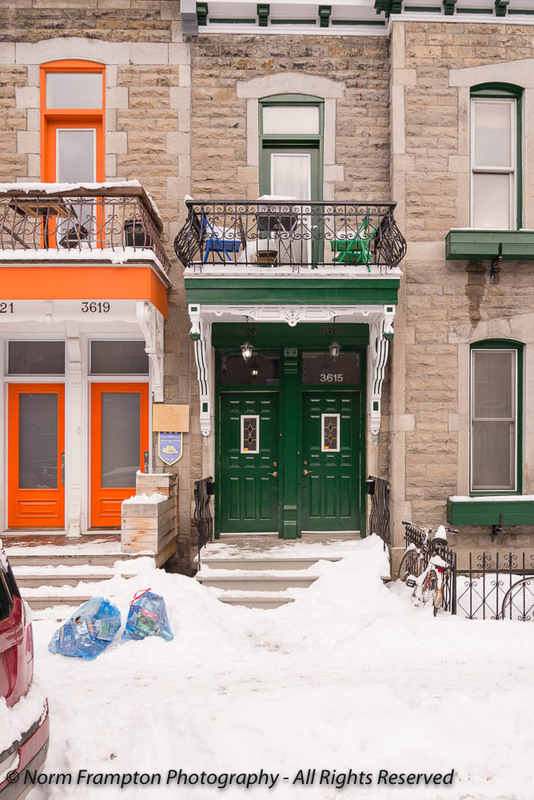 Located on the southeastern edge of the borough of Plateau Mont Royal, the park itself is somewhat small: only three small city blocks long, by one block wide. 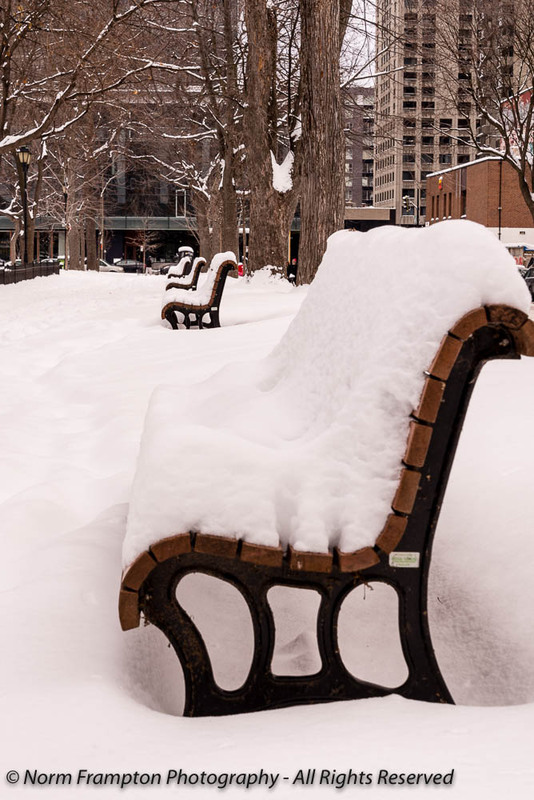 Aside from a fountain, a gazebo, and a few statues commemorating the famous french Canadian poets and writers who were at times residents of the area, the main attraction that draws in tourists regardless of the season is the homes that surround the square. Area owners and residents have recognized the attraction of their neighbourhood and have taken steps to do justice to the attention these wonderful old building receive by maintaining and decorating them accordingly. 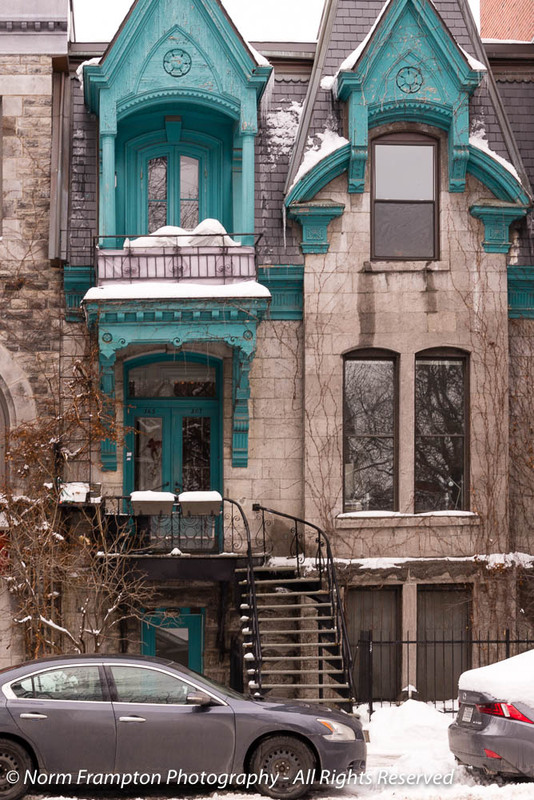 The doors, balconies, and windows are all lovingly maintained and painted with bright, vibrant, and noticeable colours that leave visitors understandably reaching for their cameras. You’ll find very few neighbourhoods anywhere with such a variety of vibrant colours. Several of these old two-story homes have been turned into Inns or B & B’s. And many are still private residences that we simply admire. I can only imagine the interior of most of these places with their 10 foot ceilings and original woodwork and mouldings. I’ll have to go back in the summer to shoot some of these again just to compare how they look with trees full of leaves rather than surrounded by snow. As always I thank you for looking. 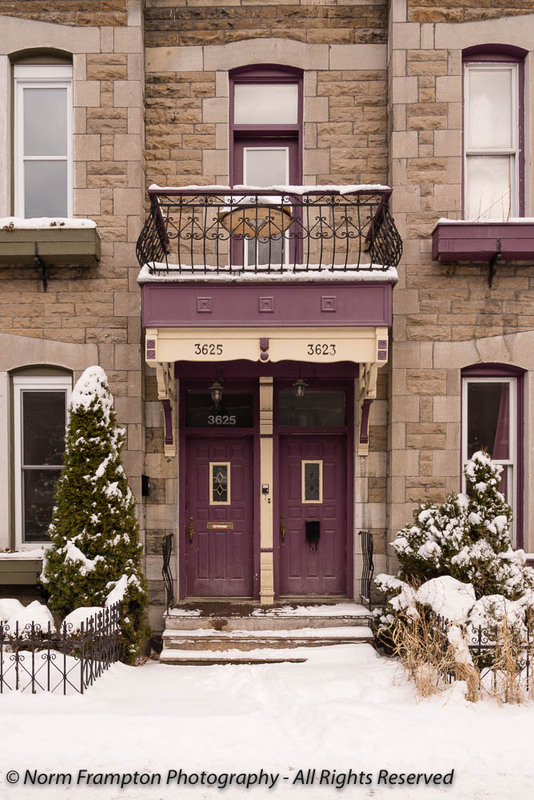 Gallery | This entry was posted in Photography, Thursday Doors and tagged Carré St-Louis, Doors, Montreal, Plateau Mont Royal, Quartier latin, Québec, Square St-Louis, St-Louis Square, street scenes, Thursday Doors. Bookmark the permalink. I must have started a comment on this post but cannot find it. . . Sometimes I don’t wait until it says reply posted, Norm. Great post Norm – should bring plenty of new visitors along! I visited Montreal many years ago and loved it. Now I remember why. the architecture is just beautiful.Thanks for showing these homes. I never knew about them before. 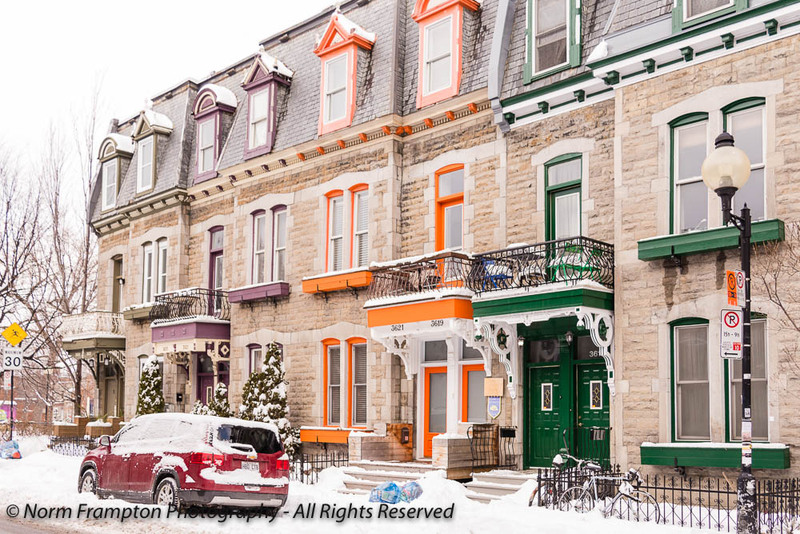 Wow, you just made a cold winter seem awfully bright with vibrant colors and beautiful buildings and doors! I’ll have to visit Montreal again one of these days! Thanks – the variety of colors is what makes it fun. What fabulous contrasting doors and trim those building have with their grey walls. 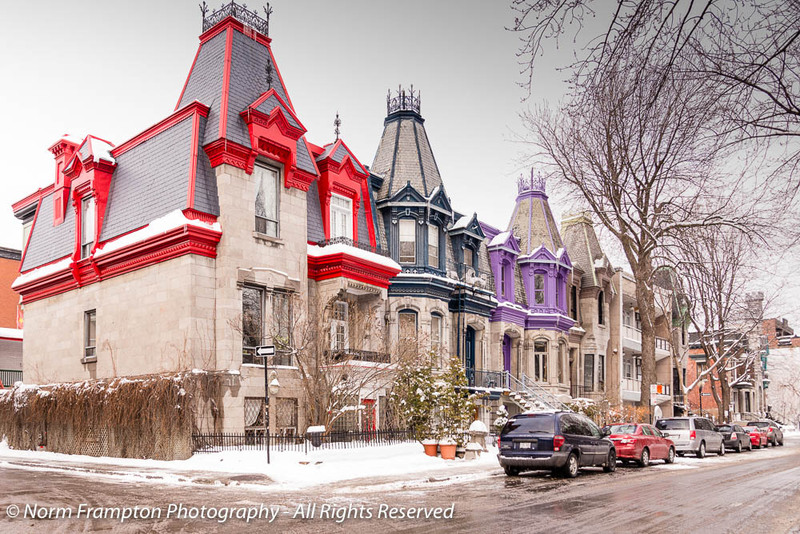 I’ve never seen Victorian homes quite like that before and the colours are even more vibrant set against the snow. Those colors are so intense, they hardly seem real! Beautiful doors, windows, roofs (rooves?) and detail. And so much variety too – it really is fun to see. Thanks – it’s the variety that impresses me. What a great fun find! Their color combinations are quite complimentary, and I love the architecture. Yes, I bet the inside of those places have some wonderful features. As always, it is a pleasure to come by your door discoveries. Thanks Michelle – I’d love to see the inside of some of these places. I love the vibrant colors! I hope you do get back there a little later in the year. I would love to see those pictures! With such colorful doors and houses this neighborhood ought to be a fun place to visit any time of the year. Very nice series! These are wonderful. They are elegant and stately.. 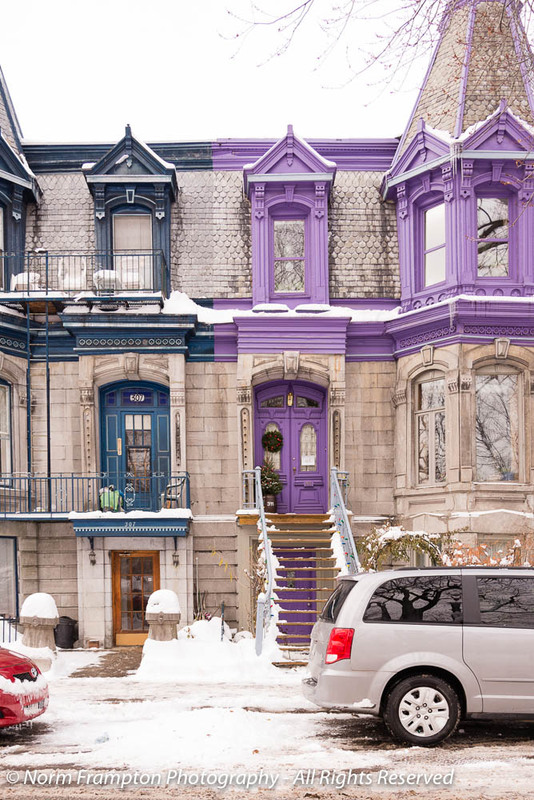 I love that a community would come together to make a conscious choice on the colours of their neighbourhood. Beautiful! Love the bold colors of the doors and trim! Lively colors to keep spirits high on the dreary and cold days of winter. Nice seeing a little snow too. These houses look especially inviting with the snow surrounding them. I imagine the insides are warm and cozy. 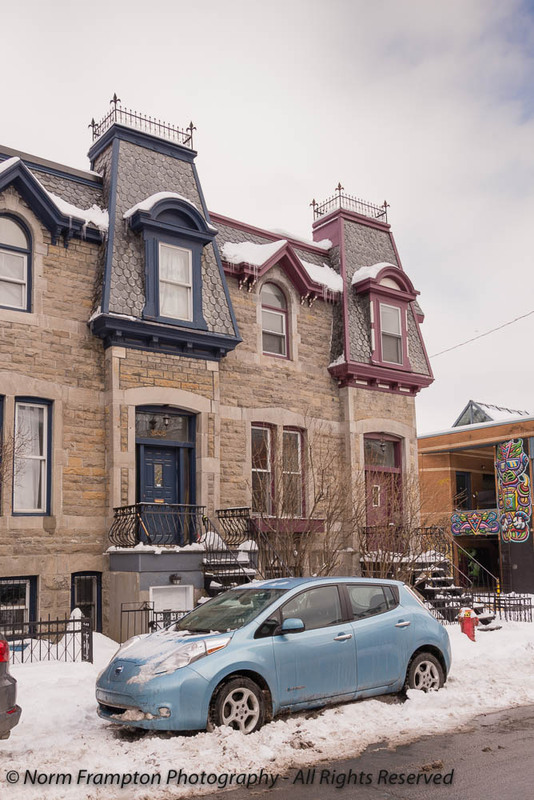 I noticed an electric car in front of one of the houses – I wonder how the snow/freezing weather affects its range? Great eye on that electric car – I hadn’t noticed it until you mentioned it. Nissan Leaf I believe? I haven’t heard anything around here about the cold affecting the range. I am so very impressed with these photos!! I really like the angle of the 1st photo where you’ve managed to capture the mood of the neighbourhood. My question is, why is it wrong for the french-speaking to refer to it as Carré St-Louis? It is simply because one doesn’t translate a proper name? I do believe there’s a neighbourhood committee that handles colour choices and the like. On the name, you’re bang on; it’s called Square St-Louis but many people incorrectly think it should be translated to “carré” when referring to it in French. I think your painted ladies are more entertaining that those in SF which seem a little staid in comparison! Your photo edits made it like a delightful movie-like Disney series:) Am almost forgetting the cold and the grey:):) The row of benches leading up to the doors in the background is a real stunner! These houses look so cute! Beautiful!! I would love to get a peek at the inside of one of these. I did once at a library in one. It had mohagany built-in shelves on all the walls, and pocket door of the same wood. Felt like a step back in time. Thanks – I’ll be doing a little more research on these and hopefully come up with some inside pics. Thanks Joey, I may just go back in spring or summer just to compare. That gives me an idea; maybe a 4 seasons comparison would be an interesting thing to do…. Fabulous colours, Norm. The only place I have visited recently which can match these is Bo Kaap in CapeTown. My doors this week are fairly nondescript, but the context is interesting. They are all from Manipur in far NE India. You definitely need to get yourself invited inside. I would LOVE to see the interiors!! What I like the most is they are able to put their own creativity with color into their homes and not be restricted to the cookie cutter colts so many new developments restrict you to. Most of these building are at least 140 years old and the residents seem to take great pride in making each one look unique. I wonder, like you Norm, does the outdoor bright colors reflect what is inside these homes? That purple house just screams, “Come inside and see what else I have to share with you!”. Such a charming neighborhood – thank you so much for bringing them to us today! Is it very near to you or was it a special trip to visit these colorful doors? Just wondering. Being someone who loves color, I absolutely adore these homes. I don’t believe anyone could live there and not have a cheerful attitude being surrounded by so many bright hues of paint. Thanks for sharing this part of Montreal, Norm. It put a smile on my face this morning! Hey, Norm. What’s all the white stuff? Still waiting for more here but only getting more rain. Love the houses, love the colors, love the doors. What more can I say? Looking forward to a summer view. 🙂 Bet it’ll be quite a transformation! Wonderful! I like the coloring of these houses, it gives them a modern touch. What a lovely neighbourhood Norman. and before I read the painted ladies I was thinking of them…. I love the buildings with the mansard roofs and the colorful dormers. I also really like the buildings with the double wooden doors with the (stained?) glass transom lights and the iron balconies. I think that’s a perfect look for an entrance. And, the elevated entrances at the bottom – wow, Norm, you’ve given me too many favorites today! Thanks Dan. It’s a very special part of the city – I thought there would be a few you’d like. I love these doors and all the colours…not to mention the snow on what’s been another hot day here! lovely post. 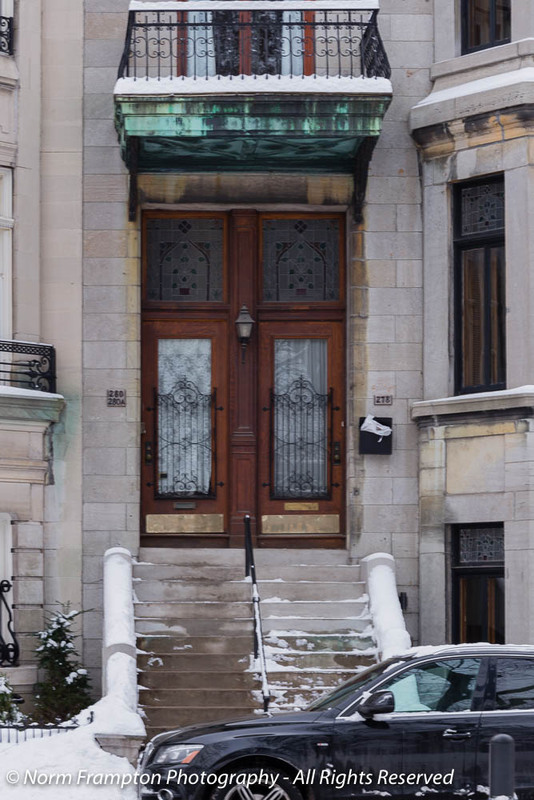 Indeed snow has personified the appeal of doors! What a wonderful place, such lovely buildings. And all that snow.